Are You “Friends” With The IRS? How many people like the IRS? According to Facebook, it’s more than 50,000! If you regularly use social media outlets to stay in touch with friends and follow people or businesses that you find interesting and relevant, consider adding the Internal Revenue Service as part of your social media interaction. 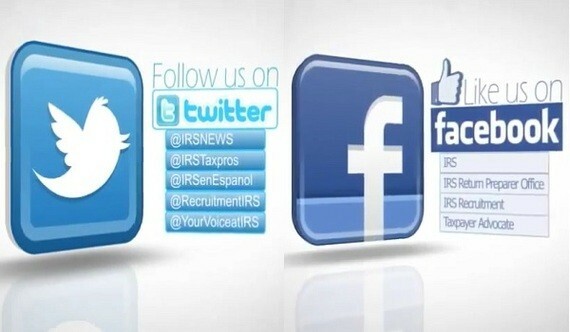 Not everyone is comfortable with contacting the IRS on social media, but consider the advantages. Social media provides more channels for you to access useful information and advice regarding your taxes, and allows you to address questions without burning up your cell phone minutes while waiting on hold. As the tax filing date grows nearer, that access becomes invaluable. Facebook – The IRS Facebook page was established in 2010 and contains useful tabs on topics such as Tax Scams and the Taxpayer Bill of Rights, as well as information about the newer health care reporting requirements established by the Affordable Care Act. General news and information are available for both individual taxpayers and those who prepare returns for others. No wonder it has more than 50,000 likes. Hablas español? @IRSenEspanol is available to help Spanish-speaking taxpayers. The Taxpayer Advocate Service, a site that serves as the voice of taxpayers within the IRS and a source of help for problem resolution, issues tweets from@YourVoiceAtIRS. Finally, if you decide you can’t beat them and decide to join them, @RecruitmentIRS helps those interested in an IRS career. Tumblr – Helpful tax-related videos and podcasts can be accessed by following the IRS onTumblr. Use your smartphone, computer, or tablet to get the information you need to find all of your potential deductions and to complete your taxes.YouTube – If you cannot find what you need on Tumblr, how aboutYouTube? The IRS has posted videos on a wide variety of topics. Seek help on deductions, common tax problems, and tips to make your tax filing experience as smooth as possible. Videos are available in American Sign Language as well as English and Spanish. With all of these forms of access to IRS information, you have little excuse not to research the information that you need to do your taxes correctly and accurately, or to gather the proper information to have someone else do them for you. While very few people enjoy doing taxes, the IRS is trying to make your tax filing experience as painless as it can possibly be. Reaching out through social media is another one of those efforts. Give them a try, and leave the IRS some constructive feedback so that they can make their social media offerings as useful as possible.